3/25/2011 - I forget what got me thinking about a polar opposite to Sylvok Lifestaff. Maybe it was the cycle of swords. Maybe it was Doug Beyer being contagiously enthusiastic about elves. Or possibly I was compleating fun Mirran cards, in the style of Blightsteel Colossus. Regardless, I am pleasantly surprised with how Sylvok Deathstaff turned out. Lifestaff is great for aggro strategies thanks to its cheap power boost while also being a huge swing in a race. It's decent in a control strategy too because it effectively doubles your chump blockers. 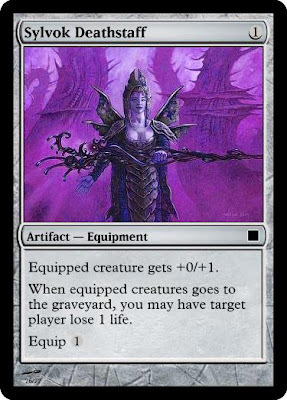 Deathstaff is still useful to various archetypes, but in an opposite way that I find fascinating. 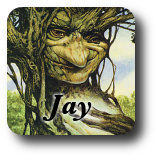 It doesn't make aggro's creatures more viscious, but it does make them harder to trade with. It still helps you in a race, because you deal extra damage when your creatures die but it doesn't let you survive any longer. It's not as useful to control, but it turns a number of existing combos into win conditions or speeds up slower combo kills (mostly including red artifact-eaters, various myr engines, Mimic Vat, Nym Deathmantle and/or Mortar Pod). It's certainly better-designed than the other Sylvok Lifestaff variant (aka Skullclamp). Though I respect the desire to entirely invert the original, I don't like how the toughness bonus (however minute) is at odds with the aggressive intention of the graveyard trigger. I'm with metaghost re: the weirdness of damage-dealing + toughness bonus. I like it as +1/-1. Skullclamp + Disciple of the Vault in one card. What's not to love? Actually, that is pretty compelling. Not sure whether I like +1/-1 to reference Skullclamp or -0/-1 to mirror Lifestaff better, but killing your own guys to hurt your opponent is neat... y'know, in a sick way. I think the +1/-1 wins out here so that it reads better to the non-maniacal mind (and is even more aggressive than the lifestaff).